Only West Chester and Millersville registered small increases but everyone else is down. Cheyney dropped almost 40 percent. Last edited by IUPNation; 10-15-2018 at 08:17 PM. I believe those numbers do not include graduate school enrollment. Fake news had reported Bloom had one of their largest freshmen classes. West Chester U, Cheyney Campus, here we go! How does Slippery Rock manage to keep their enrollment relatively steady? Nation what's the source on that graphic? Last edited by IUPNation; 10-15-2018 at 08:16 PM. I think it does, From what I hear, Student retention across the campuses was a significant problem. I know. How in the hell does Clarion have more students than Edinboro? The story does point out that there is a ongoing drop in students graduating high school, especially in the Yinzerlands. It includes grad students. The IUP numbers are the same as were cited in the Indiana Gazette last week and that article broke down the grad vs. undergrad. It's important to note that the schools said to be "growing" are either shrinking but at a slower rate than the others or the rate of growth is trending downward. It's a system in trouble. The state has a taskforce to deal with this but it's not doing enough. The state needs to do a drastic reorganization, particularly with the schools in the west. They should move immediately to merge IUP and Cal, Edinboro and Clarion, and Lock Haven and Mansfield. IUP has a capacity of 17000 and is now down to 11000. They can absorb Cal and Cal can be sold off or repurposed. Same for Mansfield. Put the Clarion/Edinboro at whichever site makes more sense. There are other things that need to be done but I feel consolidating the western schools should be done ASAP. IUP's enrollment topped out a few years ago. Now, I don't think it's a secret college is expensive, and the Philly-area kids who would normally come to IUP to get away from home are staying close at West Chester. It's a bad combination of declining high school students, state subsidies driving tuition into private school territory, and a lack of prestige. Consolidation won't fix anything because you'll lose all the rural PA students who need to commute. Roughly 40% of PASSHE students commute. A lot of them work to afford school so you'd lose them making the enrollment losses worse. The system has totally bungled their value proposition. Working class PA is paying a little bit more to attend Penn State branches, private schools discounting sticker price by 50% or more, and out of state publics offering special tuition deals. All have better reputations than PASSHE. Schools aren't as easily merged as the Bon Ton Store. The PASSHE CHancellor is still talking about innovating our way out of the problem -but he is going to have to downsize somehow. I doubt that IUP really has a capacity of 17000, I think that number comes from multiplying the number of faculty by an ideal faculty /student ratio. Facilities would never handle that many. The first thing the Chancellor should do is limit all these PASSHE is dying stories, since it must have an impact on enrollment next year. If they would have the guts to seriously downsize, it should include an increase of the enrollment standards, to try to improve the academic reputation a bit. Regardless of the great things our students do, highschoolers see the kid with the 750 SATs getting accepted to state schools. The kid with 1150 doesn't want to go to the same school as that guy. 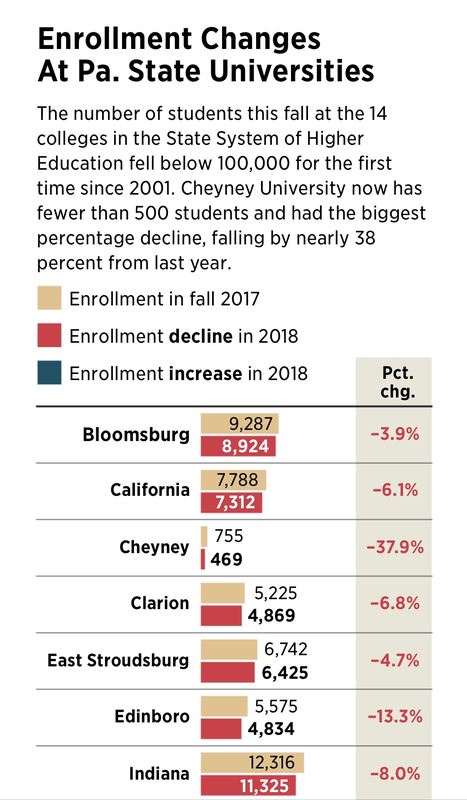 What I'm curious about is how much of this decline can also be attributed to community colleges in the state potentially drawing prospective PASSHE students away. SAT testing is bogus. I should know. No matter how much I prepared for it...I received the same 880 score the two times I took it. I graduated in the top third of my high school class and graduated from IUP with a B average. I applied to two colleges, IUP and Millersville and was accepted at both. I was offered by IUP tpo be a Summer-January freshman and Millersville for the regular fall semester as a freshman. Some people just can't take those kinds of tests and I am one of them. Also, back in those days it was better not to answer a question than to answer and get it wrong. How stupid was that? So how many of those kids in my day with their 1150 were skipping questions so not to have their score decreased? I was the type that I felt I should answer the questions. I know they don't score that way anymore but the premise that many people don't do well on standardized testing still applies. So if kids are acting like their poo don't stink because they received an 1150 and can't go to school that gives kids with a 750 a chance to prove themselves...then the kid with the 1150 is a snobby little prick who has *******s for parents. Everyone keep talking about the drop in high school graduation rates. As a member of the Baby Boomer generation, most of these schools have twice as many students as they did during my years attending them. It appears more people are attending college then every before, including state schools. One thing that maybe be a factor...or it may not....driving this in PA in the number of high school kids dropping is that in the 1980's.....Pennsylvania saw a lot of college aged people leave the state including many who weren't in college...they just left because there were no jobs in many towns. The Yinzer diaspora of that time is pretty well known. There has been huge void of people of a certain generation (late Boomer/Early Gen X) in the Yinzerlands for years. People my age would have kids in high school now. Really many of the schools now have about the same or slightly higher enrollments that they had in the 80's. IUP is below the 13000 we had in the 80's and West Chester was at about 9000 then so they are way up. But the rest...most of them were in the 4000-7000 range in those days on average...probably with Mansfield, Lock Haven and Cheyney being lower. Last edited by IUPNation; 10-16-2018 at 07:01 AM. Its a small percentage of the decline. The best CC students will eventually transfer often to a PASSHE school anyway, The ones that don't are students who probably are better off going to trade / technical schools. WCU does great with the local Philly CCs, since WCU is also as easy to get to from the City as any PSU branch campuses. in the west, there are much lower enrollments in the CCs - The real killer for PASSHE schools in the west, for IUP in particular are places like Pitt Greensburg and Johnstown, PSU Allegheny, New Kensington and Altoona. we never hear about those enrollments, certainly never in such a dramatic "the state system is failing" kind of report. Capacity for students is huge here, but the student population is declining. The drop is compared to 2010, when things maxed out, not compared to the 1990s or before. So to be fair, during that time 2005-2010 schools expanded their capacity, most expanded too fast - Administrators always want to ride a good run. They over invested, didn't improve quality of the students or academic programs much, entered markets they knew little about, and then the students started to decrease, and other competitors got better. So here we are now, in a fix. Last edited by ironmaniup; 10-16-2018 at 07:07 AM.